​NEA Jazz Master Randy Weston is one of the world’s foremost pianists, a true cultural ambassador, innovator, and visionary. He is both a riveting soloist and a dynamic leader of small and large groups, whose performance career has taken him to over forty countries throughout Africa, Europe, Asia, the Caribbean and the Americas. A pioneer in world music, he introduced the western world to the Master Gnawa Musicians from Morocco and has toured with them extensively for five decades. Mr. Weston is one of jazz music’s most respected composers, whose songs “Little Niles,” “Hi-fly,” and “Berkshire Blues,” are jazz classics that have been recorded by a multitude of artists. 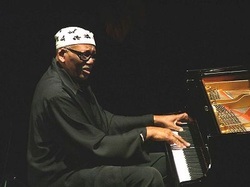 Randy Weston’s current recording The African Nubian Suite, was released on the African Rhythms label in 2016. It is a tour de force that encompasses the whole history of Randy Weston’s music, and is a great follow up to his earthy duo recording with Billy Harper from 2013, The Roots of the Blues (Universal). He is the recipient of some of the highest honors a musician can receive, including induction into the Downbeat Hall of Fame in 2016, the Lifetime Achievement Award from the Jazz Jounalists Association in 2015, the Doris Duke Award in 2014, a Guggenheim Fellowship in 2011, the ASCAP Jazz Wall of Fame in 2009, the French Order of Arts and Letters in 1997, among others. 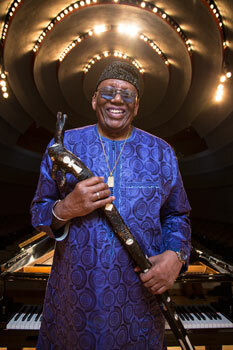 The academic world has also acknowledged Randy Weston’s contribution to American culture. In 2016, Medgar Evers College in Brooklyn, New York, named him artist in residence. The Harvard College Library acquired Randy Weston’s archives in 2015, and he has received honorary degrees from the New England Conservatory, Colby College, and Brooklyn College. In 2010, Randy Weston released his autobiography, African Rhythms, penned by esteemed journalist Willard Jenkins and published by Duke University Press. Today, Randy Weston continues to tour the world, performing, educating, and amazing audiences at 90 years old and counting. "Weston has the biggest sound of any jazz pianist since Ellington and Monk, as well as the richest most inventive beat, but his art is more than projection and time; it's the result of a studious and inspired intelligence...an intelligence that is creating a fresh synthesis of African elements with jazz technique."